We’re limping toward the end of 2018, and everyone is exhausted. In a culture where truth is malleable, spite and greed are celebrated, and unimaginable atrocities are reduced to just another fleeting set of stimuli, how could you not be? A similar sense of existential fatigue permeates Vox Lux, The Childhood Of A Leader director Brady Corbet’s new film starring Natalie Portman as a pop star whose inner life is a sinkhole she vainly attempts to fill with booze, drugs, and flippant cruelty. It’s a more cynical, and arguably more realistic, depiction of the unique malignancies of fame than this year’s other Oscar-baiting pop musical, A Star Is Born. But ultimately, it’s no more insightful. In the first of the film’s numbered chapters, 13-year-old Celeste (Raffey Cassidy) rises to fame after performing a song written by her sister, Ellie (Stacy Martin), about the school shooting in which Celeste took a bullet to the spine. What she doesn’t realize is that by getting up at that memorial and innocently sharing her suffering with the world, she’s giving herself up to a fate that—at least according to this film—is even crueler than the one suffered by her dead classmates. She’ll live, but her soul will be ground into dust by the pop-music machine. By the time we reach the extended third chapter of the film, in which an adult Celeste (Portman) and her team attempt to handle a PR disaster (terrorist attack, same difference) on the morning of an important comeback show in her hometown of Staten Island, she’s become a foul-mouthed, nihilistic narcissist in the mold of her much older manager (Jude Law). 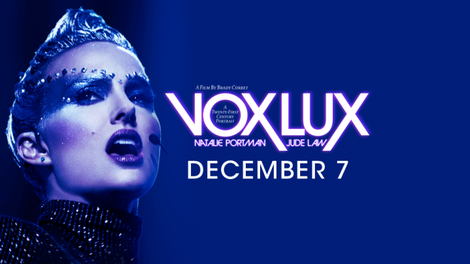 Subtitled “A 21st-Century Portrait,” Vox Lux uses a disorienting blend of shaky handheld camerawork and ostentatious editing techniques to mimic the fractured glibness and manufactured intimacy that define everyday life in 2018. From its opening moments, it establishes a godlike distance from its protagonists through narrator Willem Dafoe, who pops up every once in a while to provide novelistic context to scenes that otherwise glide by with equal—that is to say, minimal—weight. You’ll also find extensive use of sped-up film, faux home-video footage, and rapid montage, all of which achieve their presumed purpose of inducing nagging discomfort in the viewer. Even the credits are presented at the beginning of the film backwards, just to throw us off a little more. With the rest of the film shifting beneath our feet, Portman serves as our anchor. But she’s no less slippery. Although Portman manages to pull out a few moments of pathos through sheer hysterical force, mostly she plays Celeste as a person whose motivations and personality are lost in a frenzy of defensive affectations, eternally intensifying. Much like the robotic beats of the original soundtrack from pop singer Sia, it’s a technically accomplished performance put toward hollow ends. At least the character of Celeste has the illusion of depth, however; the same can’t be said for Ellie, who’s given no character beats except as the target of Celeste’s verbal abuse. Same for her daughter, Albertine (also played by Cassidy), whose function in the narrative is similarly shallow and obvious: She’s a mirror of Celeste’s own premature push into adulthood, down to being played by the same actress. In the buildup to the extended performance sequence that caps Vox Lux, Corbet tosses a number of provocative themes into the cyclone of his narrative: Aside from the school shooting, 9/11, radical Islamic terrorism, teen pregnancy, Christianity, alcoholism, drug abuse, and even the white supremacist origins of Swedish bubblegum pop all get their moment. They all point toward the same conclusion: When it comes to fame, pain and tragedy are good for business. Any of these themes could have effectively conveyed this idea, had Corbet bothered to develop them in a thoughtful way. Instead, what we get is a jumbled provocation whose only guiding principle seems to be the belief that if you make a point loud enough, it somehow becomes more cogent. How appropriate that a comment on the corrosive nature of 21st-century culture would suffer from one of its most grating fallacies.